Beautiful light. Easy to install and hangs perfectly. I love it. Created to honor the lighting vessels in New York s top decorative arts museum, this 3 light adjustable pendant lamp is a work of art. Brilliant strands of cream beads bring crucial color to the contemporary home while its tassel creates instant luxury . Love this light it looks just like more expensive ones I've been eyeing with a much more affordable price tag. Love this beaded light fixture. I put it in my daughters room and it adds so much charm to everything. The light bulbs that come with this are not too bright and are very dainty. Look nice with this type of fixture. This is a longer light and we have 9’ ceilings, perfect height. Very pretty light! Would recommend. Beautiful light. Looks beautiful in my dining room! I would highly recommend purchasing this product!!! Fast shipping and arrived in perfect condition! My search is over for the right light fixture for the area between the walk-in closet and the bath in my master bedroom! This one isn't up yet, but it will be soon. It's got beaded strands that are just beautiful and that don't require assembly. It looks expensive yet simple, eye-catching without being overpowering of the subdued style in the rest of the room. Not a stark white, but a soft creamy color, without hard metal of any kind showing. Really sweet find! With the right bulbs it gives off a good amount of light. I will definitely be removing the tassel since it doesn’t really add anything. The real disappointment was that the beads were plastic vs wooden. Most of the chandeliers that I have seen of this type have wooden beads. It definitely takes away from the effect and makes it look a lot cheaper than I was expecting. I would have returned it if we didn’t already have an electrician coming to install it that day. I probably could have discovered it in advance through more careful reading of the description, but for more than a hundred dollar price point I was not expecting a plastic light fixture. Amazing light for the price! This light is very well made. It definitely looks much more expensive than it was. Would highly recommend to anyone! I love this chandelier. We live near the coast, so I think the beads add to the cute beachy feel. The size is perfect for our foyer. I think we will cut off the burlap strings that hang off the bottom though. 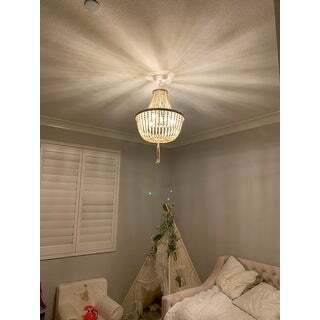 This Beaded Pendant Light is BEAUTIFUL! It’s delicate but fun. We are getting it installed next week. I don’t trust myself (or my husband) to do it but it looks fairly simple to install. 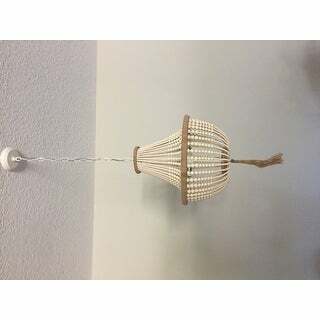 I purchased this pendant light for my little girls nursery. It looks beautiful and I am very happy with my purchase. Would recommend. Five stars! Beautiful!! It has a neat coastal or boho vibe. Very well made! The beads and metal parts are all white so it blends together nicely. 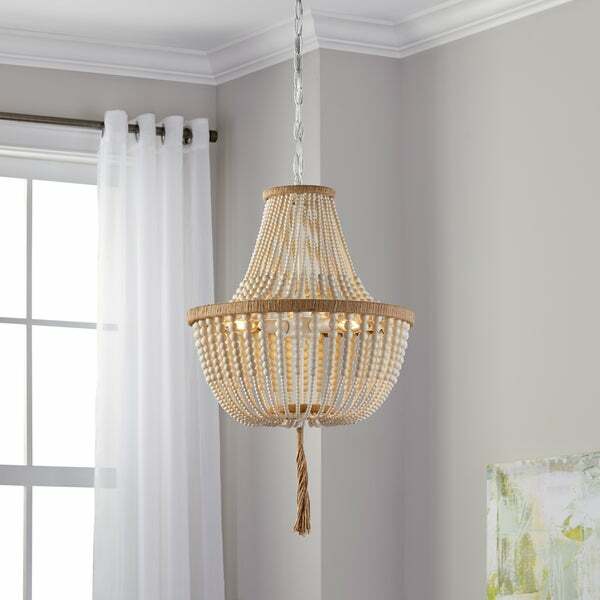 Great size and amount of light for a small to medium sized girls or guest bedroom. Love it! I made a similar one for my granddaughter’s nursery and just the beads alone cost over $100 and many hours of work! This light fixture is a great value. Beautiful light fixture. So happy with my purchase and extremely well packed was in prefect condition when it finally arrived! I receive so many compliments. We added above our dining room. I purchased different light bulbs however. This is really a beautiful piece! I love it in my home! The color is exactly as pictured. we put this up in our sons nursery room, looks so beautiful in there! I would totally make it my room, its the perfect modern but sophisticated piece in there. great quality also! I kept seeing this light fixture in design magazines and loved the feminine graceful lines. I chose to hang it in my master bedroom and it blends well with my modern farmhouse style! I'm very pleased with the quality of this Chandelier. The colors are as they appear in the image; ivory beads, and natural color rope trim. Love this light! I found one much more expensive at another site and was excited when I found this one. Easy installation. I left off the tassel at the bottom. Cannot say enough about this light, what a beautiful statement to any room. So chic and bohemian. Looks way more expensive than the price tag too! Very happy with my purchase. "Could this be used as just a hanging lamp? Like plugged in to a regular outlet and hung from a ceiling hook? " This fixture needs to be hardwired. "Can this lighting be used in Singapore? " "How many inches long is the bottom tassel? " "When will this be available to purchase again? " "how much does this product weigh?" "When will this item be back in stock?" This item will not be in stock for a minimum of six months. Please check back with us then.